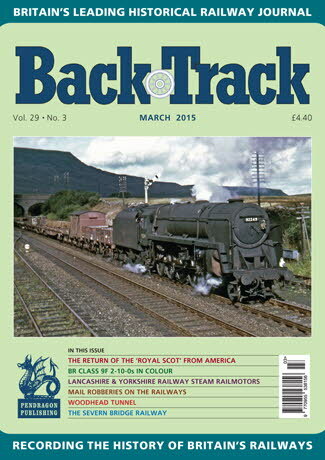 Railway Magazine | BackTrack March 2015 journal from Pendragon Publishing. London Midland Miscellany - four colour shots of steam at Shap, Ashchurch, Market Harborough and Preston. The Return and Exhibition of the 'Royal Scot' - Arnold Tortorella reviews its triumphant reception back in Britain after its 1933 trip to America and Canada. The Victorian Station Master and his staff c1885 - John L. Flann goes back to a Victorian classic for some descriptions of contemporary station work. Lancashire & Yorkshire Railway Steam Railmotors - Ian Travers describes their service practice in West Lancashire from Ormskirk and Southport 1906-33. Great Eastern Class 90s - five colour photos by John D. Mann. Mail Robberies on the Railways - by Alistair F. Nisbet. Ten-Wheelers: The BR Class 9Fs at Work - four colour pages of these heavy freight locomotives at work. Aspects of the Severn Bridge Railway - Jeffrey Wells looks back at the building of a major railway bridge which met an untimely end. Diesel Days in Ireland - Archive photos from the Roy Cole Collection. Highland Revisited - four colour pages of steam and diesel traction on the lines of the former Highland Railway. Light at the end of the Tunnel? - Tales from the dark depths of Woodhead Tunnel by Dr. Malcolm Timperley. Integrated Public Transport - colour photos of bus and rail connections in the 1960s. Through St. Neots - three pages of archive photos by Alan Tyson on the East Coast Main Line in 1962.